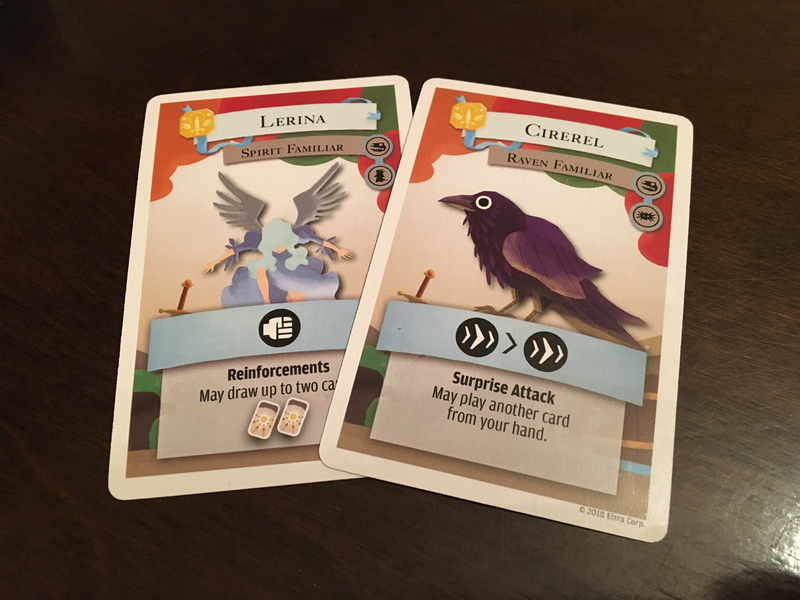 Note: I backed the Kickstarter but did receive an extra set to demo for Elzra Games. Even though the game box is small, it has that “Tiny Epic” game feel where it takes up much more table space than you might realize. 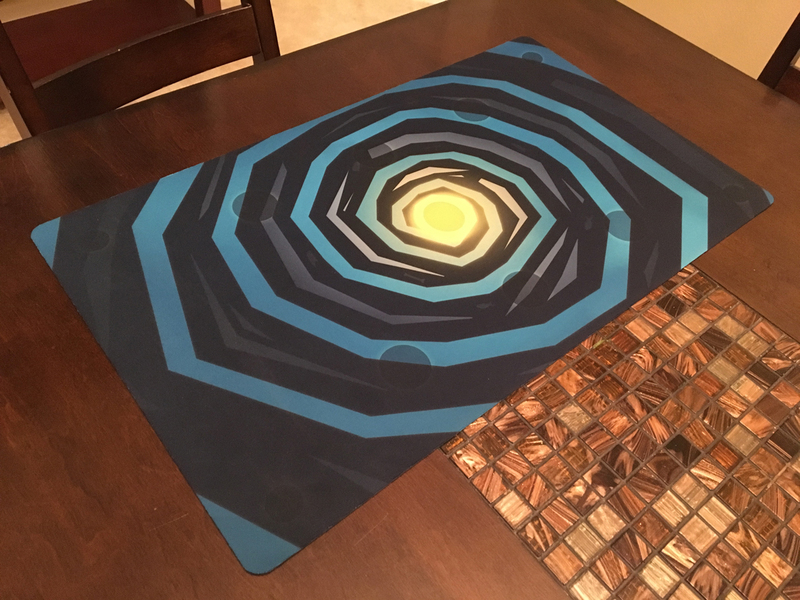 Here we have the walls and bits set up with the optional playmat. The playmat won’t fit in the box so if you were trying to be portable, you might need to leave it at home. That would be a shame though as the mat is pretty fantastic and a great upgrade for the game genre. If you could make the obstacles lock down, I think I might prefer these mats to the boards in the base Catacombs games. You’d need more of them since they wouldn’t work double sided but they are seamless, lie flat, and with the non-stick backing, don’t move around easily. You also won’t get the image fidelity out of the cloth surface but it would be hard to decide which is better ultimately. 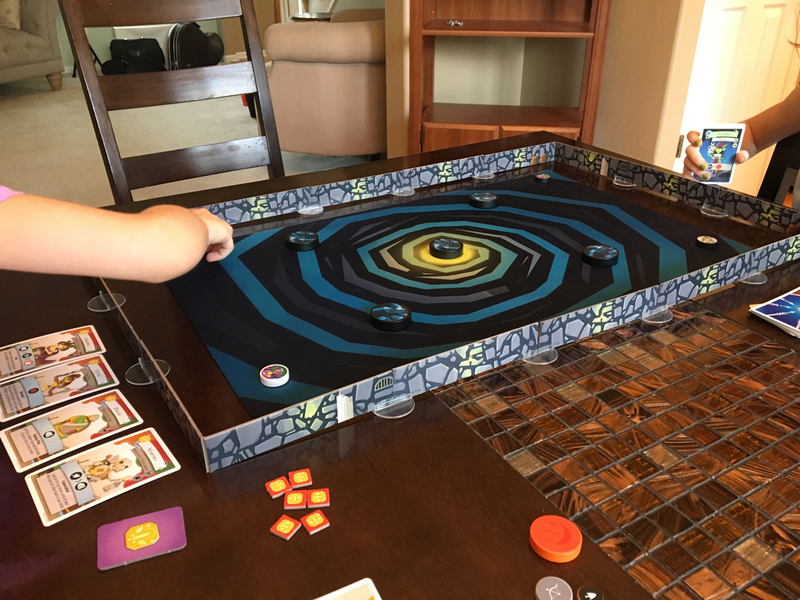 The game plays simply and smoothly, which went great for my 9 and 6 year old. 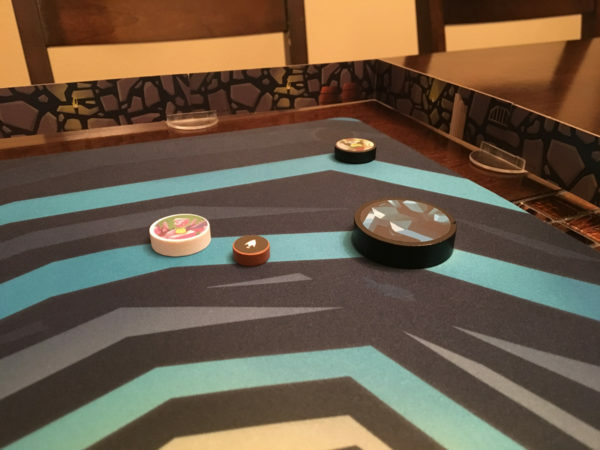 I did help explain the rules and shot icons but the concepts were intuitive and after a few turns, they were able to pick up and run with little help. Their game lasted about 20 minutes with a starting life pool of 6 life each and came down to the wire with my older daughter winning with only one life left. They both had a lot of fun and I’m sure they will start asking for the game to hit the table a lot over the coming week. As a long time Catacombs fan, I like the concept of naming the cards to correspond with the characters that exist in the story line as it brings some personality to the largely abstracted mechanics of the simplified game. It also brings more of the Catacombs world into view as we see names going to characters we’ve seen in very generic terms like the classic Raven Familiar and newer Spirit Familiar. 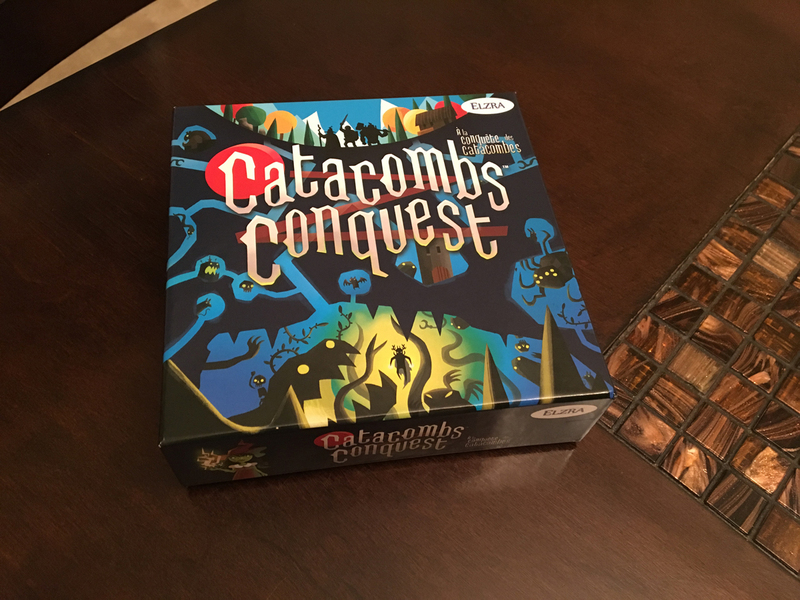 If you like a simple, no fuss, dexterity game that can work easily across a wide age group, Catacombs Conquest excels. It brings the fun without overstaying it’s welcome. In other Elzra Games news, I saw that they are working on bringing back Z-man’s cult hit, Ascending Empires. I’m looking forward to seeing what they bring with it and will be glad to see the game available again after such a long time being out of print.